I don't know if it was the day spent reading about the art of political manipulation, my allergies or from a lack of sleep, but I just cried my way through the last episode of the Golden Girls. Is that calamari around her neck? Dorothy Zbornak is known for her tent like dresses and crazy outfits covering every inch of her body, and this fits that bill. There is nothing better than a lace turleneck and long sleeves for a Miami wedding. I do think that her bouquet of calla lilies would still be loved by most brides today. I never noticed how handsome Leslie Nielson was... grrrrowl! With all this and their usual killer punchlines, why the tears? Dorothy was moving out and until the last moments, so were Rose and Sophia. The thought of those ladies splitting up just got to me! For me, the tough thing about full time graduate school is that its hard to turn it off when I get home. My brain is still wired from class and there is always more reading to do or papers to get an early start on. I can find Dorothy, Rose, Blanche and Sophia in my Tivo queue and just zone out. The show started when I was 4 years old and wrapped up when I was 11, and I don't know how or why, but I remember watching it and loving it. If I saw any of those ladies walking down the street today, I would have to hug them. Fortunately, my brother Charlie recognized this and bought me season 2 for my birthday. Even though the show has ended, their friendship can live on through my DVD player. really? 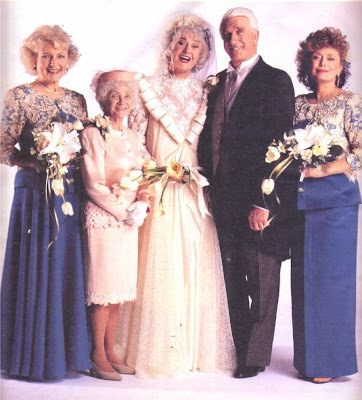 dorothy got married to blanche's UNCLE?? I had no idea anything like that happened. I applaud your love of the golden girls. i used to watch them, spell bound, when I was little. Not too long ago i was wondering about how old the characters on the show were supposed to be... 60s? how fun!